Thinning of the retinal nerve fiber layer (RNFL) of clinically unaffected eyes is seen in patients with multiple sclerosis (MS). It is uncertain when this thinning occurs, and whether ongoing RNFL loss can be measured over time with optical coherence tomography (OCT). Using time-domain OCT, we studied 34 patients with progressive MS (16 primary progressive MS, 18 secondary progressive; 14 male; 20 female; mean age at study entry 51 years; median EDSS 6; mean disease duration at study entry 12 years) on two occasions with a median interval of 575 (range 411–895) days apart. Eighteen healthy controls (10 male; eight female; mean age at study entry 46 years) were also studied twice, with a median interval of 656 days (range 398–890). Compared to controls, the patients had significant decreases in the RNFL thickness and macular volume of their clinically unaffected eyes at study entry. No significant decrease in RNFL thickness was observed between baseline and follow-up in either patients or controls. Macular volume declined significantly in patients and controls, but there was no difference in this change between the two groups. The study findings suggest that time domain OCT detects little disease-related ongoing loss of retinal axons in progressive forms of MS and has limited use for monitoring potential neuroprotective therapies at this stage of disease. 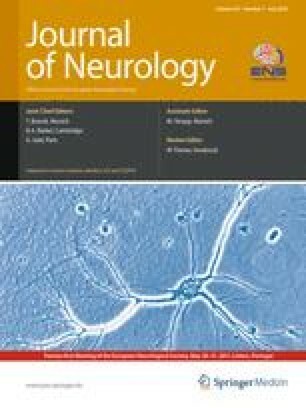 Further studies are needed using higher-resolution OCT systems and in larger groups of patients, to elucidate the timing and mechanism of RNFL loss that is observed in clinically unaffected nerves in MS.
We thank all the subjects who took part in this study. We also thank Prof. Paul Matthews for enabling the acquisition of the OCT machine; the Multiple Sclerosis Society of Great Britain and Northern Ireland (grant support to NMR Research Unit); GlaxoSmithKline (unrestricted grant for OCT machine) and Department of Health’s Comprehensive Biomedical Research Centre at University College Hospitals Trust.